Visitors are invited to stop by and enjoy food and craft beer from local restaurants and tour the new Townhome Collection model home, The Selwyn. Open daily for tours, The Selwyn is a three-story home featuring three bedrooms, two full baths, one half bath and a two-car garage. With prices in Greenway Village Townhome Collection starting from the $330s, homebuyers can choose from four additional two-and three-story floor plans with three to four bedrooms and ranging between 2,100 and 3,100 square feet. Two homes will be ready in August for move-in. Homebuyers can choose from three two- and three-story floor plans within the Cottage Collection, ranging in size from 1,900 to 3,000 square feet. These homes offer three to four bedrooms, two to three full baths, one to two half baths and two-car garages. Prices for the Cottage Collection start from the $360s. Located on Endhaven Lane, just off North Community House Road, Greenway Village is a pedestrian-friendly community with proximity to Toringdon Circle Shopping Center, which features organic supermarket Earth Fare, LA Fitness, and retail and dining options. Also nearby is Carolina Place mall, Charlotte Premium Outlets®, Ballantyne, Blakeney, StoneCrest at Piper Glen and The Arboretum. Homeowners have access to the Lower McAlpine, McMullen and Four Mile Creek Greenways for walking, hiking, running and paved surface biking. Students attend South Charlotte schools, including Endhaven Elementary, South Charlotte Middle and South Mecklenburg High schools. 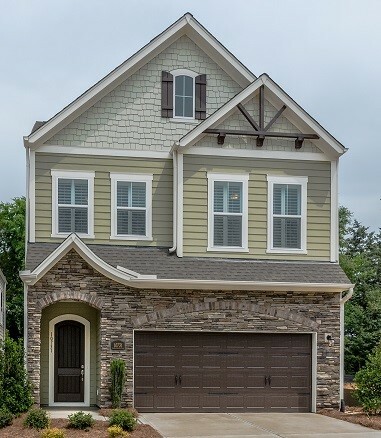 For more information on David Weekley Homes in Greenway Village, contact 704-972-4245. The Selwyn model home is open daily for tours.